Seven years ago this month, the Tea Party Movement made history. We became the most successful grassroots political movement in modern history. Sparked by a rant, inspired by the Constitution, fueled by our frustration with an out of control government, and determined to act, we came together on April 15, 2009, and we are still making history! I recently looked back at the text of the speech that I gave on that day. Much of what I said remains true today. “Perhaps we should have stood up many years ago, before our government became so bloated, corrupt, arrogant and greedy, but it is not too late to slay the monster that we’ve fed for too many years. Our commitment has not diminished. It has morphed from anger and confusion into action. Millions of Americans who were completely disengaged from the political process have volunteered to help candidates, canvassed for petition signatures or even run for office. Before April 15, 2009, many of us had never met an elected official beyond our local town board. Now, we know a broad spectrum of politicians and potential candidates. We have been educated in the Constitution. We know the issues. We’ve learned a lot of history. We’ve been inspired by resurrecting the words of Adams, Jefferson, and Madison, and words from people many of us didn’t know before; Bastiat, Hayek, and Rand. We created networks of patriots. We have become the citizens we always should have been. We gathered over 2,000 people in Lincoln Square, sent hundreds of people to rally in Washington, D.C., and made thousands of phone calls. We’ve had wins and we’ve had losses. 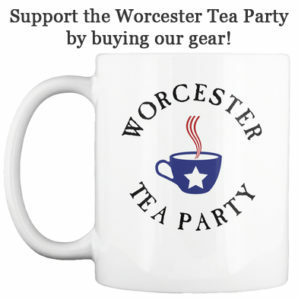 The Worcester Tea Party has been mentioned in books about the Tea Party Movement and in Time Magazine. We were even featured in a BBC America comedy reality show. So, after 7 years, where are we? It seems like we’ve made little progress, but the mobilization of millions of Americans is progress. We are fighting a Leviathan, the likes of which has never existed in the history of civilization. Despite the enormity of our task, we drive on, changed, but not deterred. A quote that describes our motivation is one that has become one of my favorites, and one that we’ve heard many times over the past seven years. Ironically, it comes from one of the Republican Party’s most notorious Progressives, Theodore Roosevelt. Some of us may have had our faces marred by sweat and dust (thankfully no blood, yet), but we strive on, knowing that the cause of liberty is a just cause. Though it remains out of reach today, we stay in the arena because our success would be a “triumph of high achievement”. Happy Anniversary to the Tea Party Movement! Congratulations for surviving the brickbats from the left and the establishment! Kudos for standing up to the IRS! High fives for defending our Constitution! It’s hard to say for certain how far we’ve advanced, but we can be certain that our republic would be in much more dire condition if we had not jumped into the arena. In closing, I’d like to remind you of our mission and thank you for being part of this grand task. The return to our founding principles of individual responsibility and limited government. Sound fiscal policy from Washington, Beacon Hill, and City Hall. The reduction of the tax and regulatory burden heaped on businesses, communities and families here in the Commonwealth and across the country. Transparency as the means to hold our leadership accountable for their complete disregard for American principles. The Worcester Tea Party seeks to accomplish these objectives through recruiting, educating, organizing, and mobilizing the citizens of greater Worcester County.